The spring weather is putting us in the mood for cool and delicious drinks. So for dinner tonight, we recommend these veggie tostadas paired with a frosty blended margarita. This recipe calls for 98% fat-free flour tortillas, fat-free refried beans, and reduced-fat feta cheese to keep calories to a minimum. Additionally, this dish is topped with tasty ingredients like olives, avocado, tomatoes, and jalapeños. At only 318 calories per serving, this low-fat Mexican meal is one of our weeknight favorites. To make this recipe, first place a tortilla on a baking sheet, and broil for 1 minute on each side or until lightly browned. Repeat procedure with remaining tortilla. Combine beans and enchilada sauce in a small saucepan; cook over medium heat until hot. Spread half of bean mixture over each tortilla; top evenly with remaining ingredients. 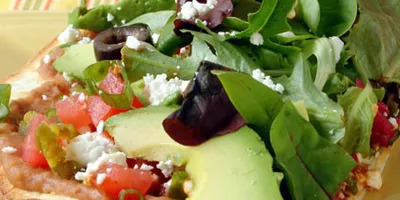 Ingredients: fat-free flour tortillas, fat-free refried beans, enchilada sauce, gourmet salad greens, plum tomato, green onions, ripe olives, avocado, jalapeños, reduced-fat feta cheese. 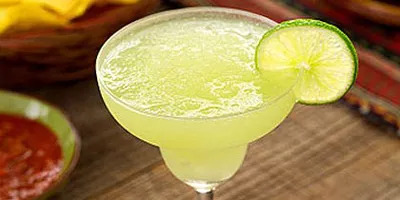 Our frosty margaritas are also simple to make, and you can even make a virgin batch for the kids. They're loaded with limes and lime juice, which are rich in vitamin C.
First, run a lime wedge around the edge of each glass. Then dip rims into a saucer filled with the salt. Put the remaining ingredients into a blender; blend until the ice cubes are chipped and the mixture becomes frothy. Pour the mixture into the prepared glasses; garnish with lime. Ingredients: lime wedges, kosher salt, juice from Mexican limóns or fresh limes, tequila, Cointreau, superfine sugar, ice cubes.